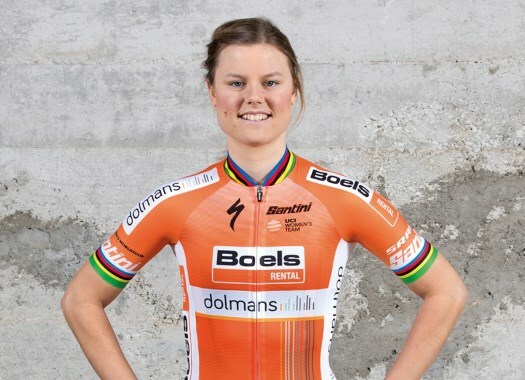 Boels-Dolmans' Amalie Dideriksen took the victory at the fourth stage's bunch sprint of the OVO Energy Women's Tour. The rider crossed the finish line ahead of Lotta Lepistö and Marianne Vos. The penultimate racing day in Britain took the riders through a 130-kilometre route between Evesham and Worcester. Hitec Products' Charlotte Becker attacked at 11 kilometres into the race and soon built an advantage of more than one minute over the pack. Around 30 kilometres later, Cecilie Uttrup Ludwig (Cervelo-Bigla) and Audrey Cordon-Ragot (Wiggle-High5) managed to bridge from the peloton and joined Becker at the front. The three riders worked together and created a gap of more than two minutes with the bunch. The trio kept trying to maintain a good lead on the pack, while behind Sunweb worked hard to keep the leader's jersey on the shoulders of Coryn Rivera. The pack was successful at six kilometres to go when they reeled back in the escapees and kept rolling hard for a bunch sprint. The former World Champion Amalie Dideriksen (Boels-Dolmans) was the fastest at the final sprint. Lotta Lepistö (Cervelo-Bigla) and Marianne Vos (WaowDeals) were second and third on the day. Rivera keeps the GC and points classification lead, while Becker took the Combativity Award of the stage.